If this is indeed your first quilt, your choice of fabric is critical. Quilters normally use 100 percent cotton fabric. 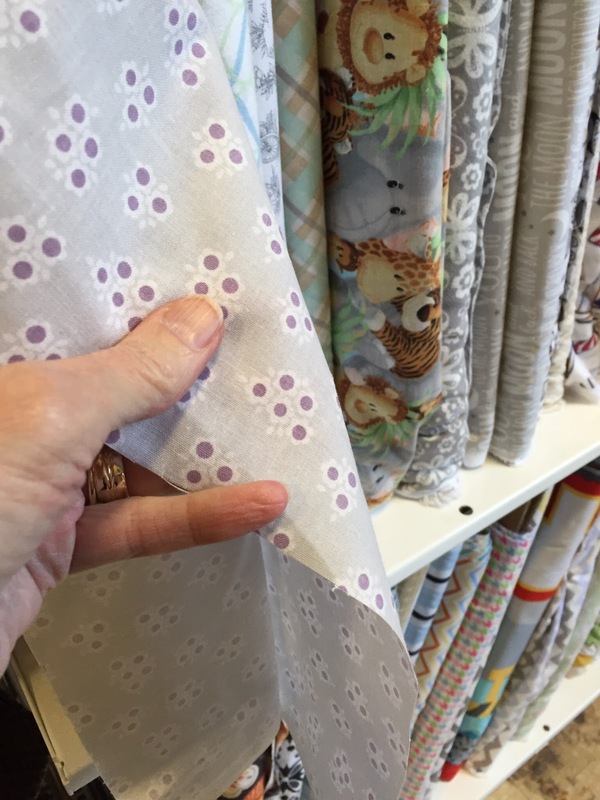 A visit to your local “big box fabric store” might show you lots of pretty fabrics, but there are a few more things to look for beyond just a pretty fabric. When you walk in the store, I want you to touch the fabric. That’s right, it won’t bite you. You will be touching this fabric as you sew it, and the finished quilt will be used by someone who will be touching it a lot. Pet the fabric. Nice, pretty fabric! Don’t you love it? Find some pretty cloth and pet it some more. Crinkle some up in your hand. Yes, wad it up and see if it holds a crease when released. You want the fabric to be soft to the touch, not coarse and stiff. If it has a lot of starch and chemicals in it, it will hold more of a crease when released. Walk around the aisles of fabric, then stop and stand in place. With your eyes closed, reach out and touch several different bolts of fabric. Run your fingers over the cloth, and compare a few different fabrics from different manufacturers. Which ones feel the softest to the touch? Which are stiff? Which ones make you cringe? Let’s avoid the stiff fabric. Here’s why. 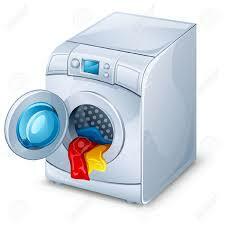 Stiff fabric may have a lot of chemicals, starches and other products on it that make it stiff. It may also have been woven with thick thread! 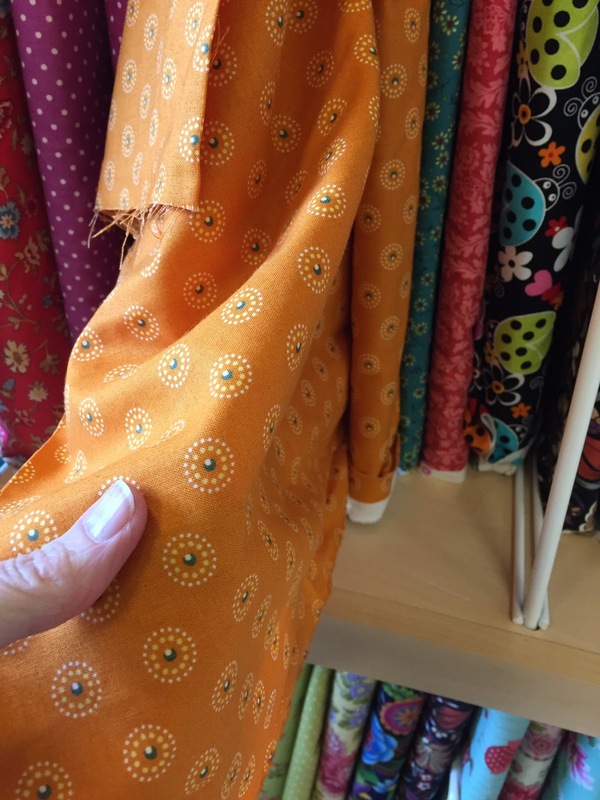 Tightly woven fabric can be very stiff AND make it much more difficult to stitch on, especially if you are going to do applique or piecing by hand. Let’s not even think about hand quilting a quilt made with stiff fabric! My hands hurt just thinking about that! 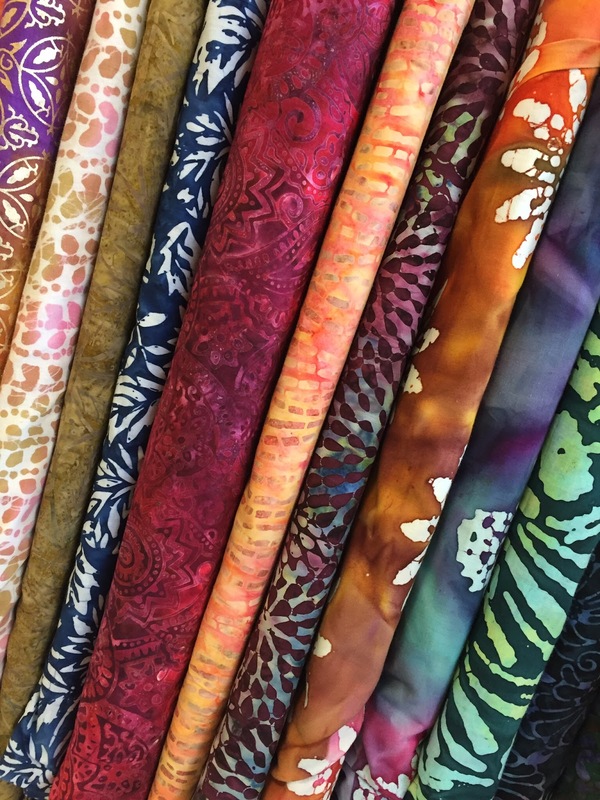 If you just can’t resist using a batik – and I don’t blame you at all – I suggest that you wash the fabric several times in your washing machine with hot water and detergent. It won’t hurt it! In fact, it will help soften the fabric for you. Some batik fabrics also include the application of paint or a paint-like substance on the fabric. 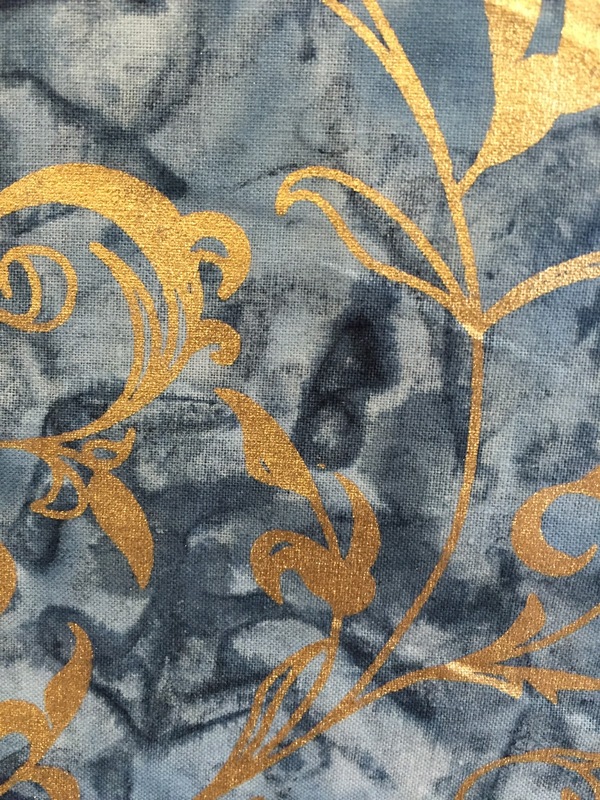 Take a look at the gorgeous fabric here, especially the gold parts. Isn’t that stunning? Yes, it is, but the gold parts feel like rubber that will not play nicely with your needle. A similar process is used when creating many of the beautiful white-on-white prints that you will see. The fabric I am holding here is a very light gray, with rubbery white circles and little purple dots in the middle Cute as the dickens, but you can bet your needle will struggle to stitch through it. I am mostly a hand quilter. 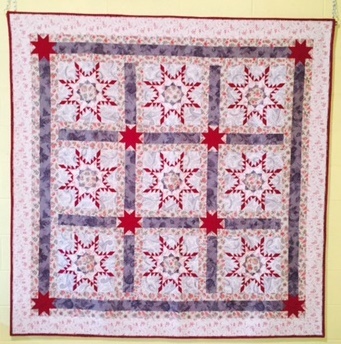 I usually piece my quilts by hand and all applique work is sewn by hand. Most of my quilts (not all, but most) are quilted by hand. I want all chemicals and gunk OUT of my fabric before I start cutting and stitching it. Thus, I have a practice (ok, a phoebia) that dictates all new fabric must visit the washer and dryer as soon as it comes in the house. Always. No exceptions. I have seen too many people cry about dye running from one fabric to another in their finished quilts. I know when I sew my quilts that there will be no such crying in my house, as all excess dye is removed and tested by me prior to use. I am assured that chemicals are gone, starch is gone, etc. Many new quilters ask me how much fabric they should purchase if they find something they absolutely cannot live without. That depends entirely on what you plan to do with the fabric. Some people think that three yards is enough. Some think 5 yards is a must. I have many whole bolts of fabric in my basement sewing area that I have had for decades. It does get used, bit by bit, little by little. Please know that I am not a member of the Quilt Police, I do not wear a badge, and you are free to do what you want to do with your own fabric and quilts. My guidelines mentioned above have served me well for almost 40 years, and I stick by them. You may, however, feel free to contact me if you use fabrics in your quilts that have not been washed and you find the dye runing onto other fabrics. I can help you learn how to get the excess dye out. If you have any questions, please don’t hesitate to ask! Leave them in the comment area below.